It’s an exciting day at Pinehurst. The LPGA today announced that the final edition of the revamped LPGA Qualifying Tournament will take place at Pinehurst Resort from Oct. 22-Nov. 3, 2018. Instead of 90 holes like the old Final Stage, the new Q-Series will be 144 holes. Players will compete in two, four-day tournaments with cumulative scores over the eight rounds for a $150,000 purse. The LPGA will debut the new Q-Series at Pinehurst, which has hosted several prestigious tournaments including the 2014 U.S. Women’s Open. 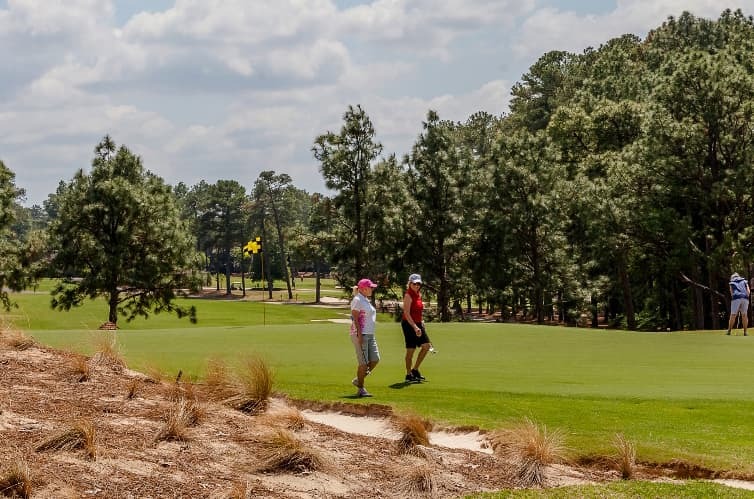 The first week of the LPGA Q-Series presented by Blue Cross Blue Shield of North Carolina will be played on the George- and Tom Fazio-designed Pinehurst Course No. 6 from Oct. 24-27, while the Q-Series will conclude on the Rees Jones-designed Pinehurst Course No. 7 from Oct. 31- Nov. 3, 2018. At minimum, the top 45 finishers and ties from Q-Series will receive LPGA membership, with the rest earning Symetra Tour membership. For a comparison, at the 2017 Final Stage only 20 players earned their LPGA cards. The Q Series at Pinehurst continues a long history of women’s golf here. When you walk into the Pinehurst clubhouse and see the vintage photographs on our walls, a timeline emerges. You see an image of Donald Ross in 1901 just after he arrived in Pinehurst, closely followed by 1920s-era postcards extolling the virtues of Pinehurst. Mixed in are images of Walter Hagen and Gene Sarazen at the 1936 PGA Championship, and in a few steps more you see Ben Hogan and Sam Snead at the North & South Open. Eventually, you pass through the black and white photographs of the 1951 Ryder Cup, of Arnold Palmer’s annual visits to compete in the North & South Amateur and a youthful Jack Nicklaus accepting the trophy for winning at Pinehurst, just months before he burst onto the scene when he won the 1959 U.S. Amateur. The photos, though, soon change to color – images of Payne Stewart’s triumph in 1999, and the U.S. Opens in 2005 and 2014. There you can see Michelle Wie raising her arms after winning the U.S. Women’s Open, large photos nestled next to ones of Lexi Thompson and Juli Inkster, and of then 11-year-old Lucy Li. We’re proud at Pinehurst to have such a rich history, one in which photos from over a century ago remain as relevant as the ones from major championships just a few years back. But at the heart of our hallway rests, right in the center, the wall commemorating the North & South Amateur, which is the longest consecutively-running amateur championship in the United States. Every year since 1903, Pinehurst has been home to one of the most prestigious women’s golf championships in history. Babe Zaharias won the Women’s North & South Amateur in 1947. The names on that wall include some of the most important women in the history of the women’s game, including members of the 13 Founders of the LPGA Tour. Opal Hill won the North & South Amateur in 1928. Louise Suggs won three times, and in one three-year stretch, from 1946-1948, the champions hailing from Pinehurst were Suggs, Peggy Kirk Bell and Babe Zaharias. But like the photos in our hall, the Women’s North & South has stood the test of time. In the 15 championships since 2003, 10 Women’s North & South Amateur champions have gone on to play on the LPGA Tour. They’ve combined for 21 wins, eight major championships and more than $32 million in career earnings – and those numbers don’t include the great career of Laura Diaz, who, as the 1995 North & South Champion, we’re so happy to welcome back to Pinehurst today. Danielle Kang won the 2011 Women’s North & South Amateur, and won her first LPGA major championship last year. Pinehurst No. 2 receives so much praise and attention of the golf world. But we’re proud of all nine courses at Pinehurst, each of which tests the games of the best players in the world. Pinehurst No. 6 and No. 7 are two of our finest courses, featuring some of the most dramatic shotmaking needed to succeed at Pinehurst. Some have called No. 7 our toughest course, and that includes No. 2. Maybe that’s why No. 7 is the only course here where Tiger Woods has won, back when he was a 17-year-old junior golfer at the “Big I” national tournament in 1992. We’re fortunate every summer to watch the future stars of the LPGA Tour come through Pinehurst, to watch them compete on our courses, knowing that in just a few years, we will likely be seeing their names again on leaderboards at LPGA Tour events and major championships. To have the opportunity this year to see so many women’s dreams of playing on the LPGA Tour come to fruition only hours after completing their rounds on our courses is a tremendous honor, and one we’ll never forget. We look forward to seeing those moments happen in real time – and in pictures, too.